ECOsmarte® Planet Friendly brings state-of-the-art water treatment technology to the commercial pool and spa market. 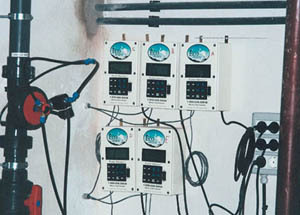 We offer customized systems for public pools, spas and resorts designed to meet minimum chlorine residual requirements. Chlorine is under attack not only from health conscious groups, but also from the federal government, which is enacting legislation to minimize and, eventually, eliminate the use of toxic chemicals as water disinfectants. Chloroform and dioxin are chloromine by-products of chlorination registered at the U.S. Center for Disease Control, Toxic Registry. This growing awareness of environmental and human health concerns on the use of chlorine will require public agencies to rethink and reduce the use of chlorine, bromine and other halogens for all forms of water treatment. Chlorination and chemical control of simple biological organisms have proven useful and effective, but not without a cost. The adverse effects on the health of humans and the environment of chlorine, bromine, aluminum, phosphates, chromates and other sanitizing agents are well documented (See Health & Beauty – Links). 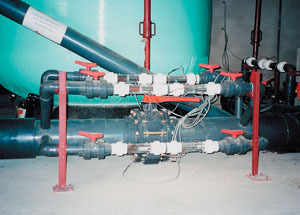 Our state-of-the-art-water treatment systems consume a fraction of the energy required for ozone systems while generating 10 times the amount of oxygen, have no toxic or environmentally “unfriendly” by-products or discharge, and have the science and corporate credibility of ten year’s of experience with water chemistry and treatment. The ECOsmarte® commercial pool and spa system has outperformed free chlorine alone and chlorine/ozone systems for cost efficiency, odor control, microbe control, water clarity and ease-of-use. “We would like to express our great satisfaction with the results from your ECOsmarte system we installed in our Olympic pool in November 2000. We have drastically reduced our use of chemicals (66 gallons of sodium hypochlorite per day reduced to 6 gallons now) while maintaining exceptional water quality. 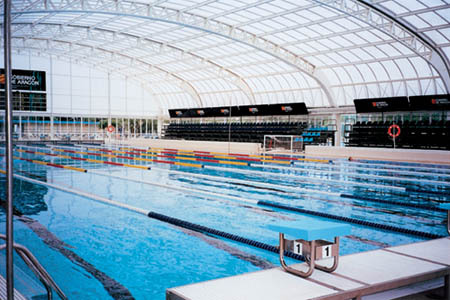 Our Waterpolo National Team (World Champion Team, nowadays) and other teams participating in past King Cup Championships celebrate our pool because it frees the swimmers from the inconvenient atmosphere created by chloramine-charged water, while getting a reduction in tiredness and a higher sport productivity of each player. All of them consider our pool a model of water treatment with excellent conditions, ease of breathing and no irritation has been suffered.